The deadlift is one of the big three lifts, along with the bench press and the squat. The so-called “big three” are the three exercises anyone trying to build muscle needs to include in their workout regimen. Why? These three movements work several muscle groups at once, which makes them ideal for boosting overall strength and mass gains. This is particularly true for the deadlift. It requires use of the traps, lats, lower back, glutes, hamstrings, quads and calves. In order to help you master this lift and get one more rep on your next set, we put together these tips and a training program. Tip #1: Use the proper form. 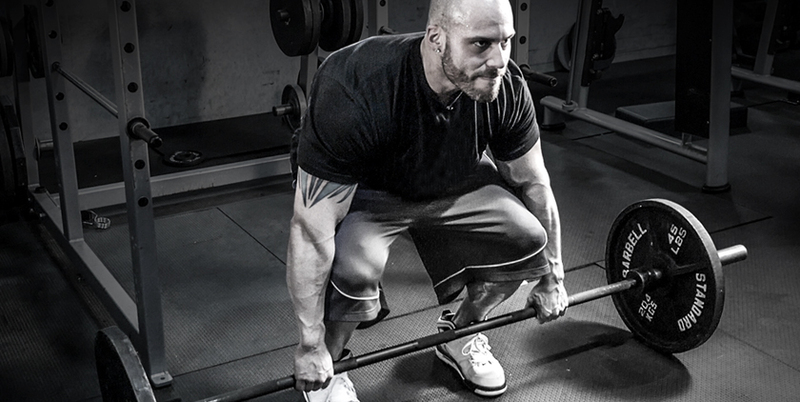 The deadlift is a difficult movement, so the potential for hurting yourself is substantial. Always practice your form with a low weight. Position the barbell in front of you and arrange your hands in a shoulder-width grip. Place one hand on the bar with an overhand grip, the other with an underhand grip. Bend your knees and get the bar as close to you as possible to help keep your back straight. To start the movement, push down through your heels and explode upwards with the bar until you’re standing up straight. Be sure to keep your back straight! At the top of the movement, roll your shoulders back and thrust your chest out to engage the upper back. Then slowly bend your knees, bend your waist forward to straighten out your back again, and set the weight down to complete the rep. Tip #2: Make sure you’re hydrated. Water is used to transport nutrients to the muscle cells and then remove waste products. It’s kind of like the lubrication for your muscles. Without water, your muscles are deprived of electrolytes, so they’re more likely to cramp. Plus, muscles are controlled by nerves, so without the proper water and electrolyte balance, muscle strength and control will be impaired. A mere 3% hydration level could reduce your strength by 19%! Tip #3: Do accessory work. Do four sets of at least eight reps with a weight you could comfortably do 10-12 reps with. Tip #4: Take advantage of a de-load week. That’s right. We’re actually telling you to take a week off from the gym. When you’re training specifically to add another rep, your body will need time to heal and prepare itself. Taking a week off to recover ensures that you’re in the best possible condition when it comes time to get that extra rep. In order to use the following program, you first need to know your one rep max (1RM). Then, by training at a certain percentage of your 1RM, you are able to put a calculated amount of stress on a muscle over a certain period of time. This specificity will create the fastest rate of muscle growth, and therefore, strength. For help calculating your one rep max, click here and download the product brochure. Before you even start your set, take a scoop of the all new One More Rep™ pre-workout. This evolutionary formula will help you feel energized and focused so you can dial in on the task at hand.